The Department of Biotechnology was established from the session 2005–2006 by the order no. 914/2005, dated 20/4/05 of Directorate of Higher Education, Govt. of Chhattisgarh, with both Undergraduate and Postgraduate programme and the programme was affiliated by Pt. Ravishanka Shula University, Raipur by order no. 914/Ace./Affl./2007, dated 17/5/2007. Pt. Ravishankar Shukla University, Raipur has recognized our department as Research Centre for Ph.D. Programme in 2011 by order no. 4371/Ace/Res/2011, dated 30/07/2011. Latter in 2012, the Department of Biotechnology, Govt. of India has granted us STAR College Programme. The aim and objective of the department is to nurture youth of the state for scientific exploitation of natural resources in sustainable manner, to explore health problem of the state and to protect environment and Biodiversity of the state by the help of tools and techniques of Biotechnology. To fulfill the mission of exploration of natural resource, existing health cause and environmental protection, the department has initiated skill development among youngsters of the state by UG, PG and Ph.D. programme. .
With the aim of above mission and vision the department is organizing UG, PG, Ph.D programme in close collaboration of various international, national institutions and industrial houses, so that we may provide skilled human resource to the academic and industrial houses for overall growth of Chhattisgarh state and finally Nation. Integrated Human Resource Development is a flagship programme of the Department of Biotechnology to create well trained manpower to cater the needs of R&D, teaching and industry. Biotechnology is regarded as the greatest intellectual enterprise of human kind and for meeting its basic requirements of food, health, nutrition, ecological and livelihood security. World has witnessed phenomenal progress in this field specially after the unraveling of the double helix structure of DNA by Watson & Crick. For research and development and application of Biotechnology which is knowledge and capital intensive, skilled human resource is critical. Realizing the need of the well trained manpower in multidisciplinary and rapidly advancing area of Biotechnology the Department has conceived an integrated human resource development programme feathered with undergraduate, postgraduate and Doctoral courses to fulfill the need of R&D, teaching and Industry at both global and local level. At local level we have incepted various prospects and problems in the field of haemoglobinopathesis, genotoxicology, communicable diseases, gene frequency prospects related to pathogenesis, natural product exploitation , biomolecule of natural resources related to pharmaceutical, nutritional and cosmetic significance from local resources, water bodies diversity/ contamination and biodiversity as a vision of the department for their scientific evaluation and application in larger interest of people specially for Chhattisgarh. Translating the action, the Department has made conscious efforts to fulfill the vision, following mission have been incepted. As a primary mission we have undertaken to popularize the subject among common stakeholders by providing the scientific input concerned with need, prospects and applicability. Our next step mission is to develop skilled human resource by both theoretical and intense hands on training programme to meet the need of R&D, Industry and Society. Under this mission one research based internal project in each semester and one external project during the two years course are effective tool beside large number participation of students in the programme of Biotech Consortium India Limited training programme. Our final step mission is to develop an environment for research based activities. To fulfill this mission we have Ph.D. programme with several fellowships viz. Women Scientists programme of DST (Both A&B), Young Scientist Fellow, Rajiv Gandhi Fellow, Maulana Azad National Fellow, ICMR Fellow, Indira Gandhi Single Girl Child Fellow etc. The main theme of our research mission are - evaluation of genotoxicity, gene frequency of various diseases in the society, haemoglobinopathesis, natural product exploitation, scientific validation of traditional knowledge are based on local and global need so that our product as human resource may be more and more skilled , competent and useful for the Society. As a societal mission we have opted large scale extension programme to the society of catchment area viz. Screening of Sickle Cell Anemia, Chemokine receptors of HIV in population, Tobacco and Tobacco produce induced pathogenecity, Radiation induced genotoxicity, Evaluation of Cyanotoxin from water bodies, Screening of Arsenic and Fluoride like toxic chemical from drinking water source of society, Mushroom cultivation for livelihood, Evaluation of Secondary Metabolites from Medicinal Plants and it’s commercialization skill to the local people etc. Member & recognized guide of department. • Title – Study of Sickle Cell Disease and its genetic flow in some area of Rajnandgaon and Durg district of Chhattisgarh (India). Funding Agency – Department of Science and Technology, Govt. of India. Women Scientist – Seema Tripathi. Reference – No. SSD/SS/025/2006, Dated : April 20, 2007. 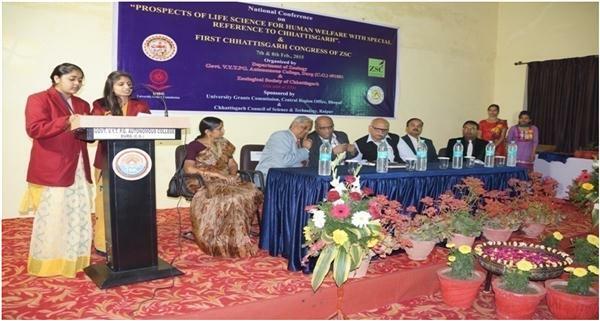 • Title – Study of Sickle Cell Hemoglobinopathes in some area of Chhattisgarh. Funding Agency – University Grant Commission, New Delhi. • Title – Isolation and Characterization of Biomolecules of Pharmaceutical, Cosmetic and Nutritional Importance from Native plants of Chhattisgarh State. • Title – Evaluation of Antioxidant properties of some medicinal plants on Lymphocyte of Oryctolagus cuniculus. Reference – 2154/CCOST/MRP/2013, Dated : March 22, 2013. Title - “A Study on the prevalence of human parvovirus B19 from Sickle Cell Anemia affected population of tribal area of Rajnandgaon district of Chhattisgarh”. Title - “Study of Genetic Polymorphism of Chemokines Receptors for the HIV-1 Infection in Some Tribal Population of Chhattisgarh, India”. Three students have completed and submitted their PhD thesis in Biotechnology in the year 2015. 3. "Study on Biodegradation of Some Synthetic Dye using Aspergillus species and Effect of Physico Chemical Parameters". – Shishir Vind Sharma. a. “Smokeless Tobacco Induced Genotoxicity And Its Molecular Validation Among Population Of Chhattisgarh (India”) – Mr. Rakesh Dadsena. c. Study on Prevalance of GST (GSTM1, GSTT1 & GSTP1) Gene Polymorphism among Sickle Cell Population of Durg District of Chhattisgarh, India.” – Ekta Singh. d. “Study of Glucose-6-Phosphate Dehydrogenase Deficiency and its Genetic Polymorphism from Tribal Population of Durg, Rajnandgaon and Raipur Districts of Chhattisgarh, India.” – Lohit Raj Shivwanshi. Shweta Yadav, Abha Singh, Anil Kumar, Allelopathy of Parthenium hysterophorus in and around Durg-Bhilai City. Nature Environment and Pollution Technology, Vol. 5(1), 93-94, 2006. Ttipti Thakur, Rakesh Dadsena, S.B. Nandeshwar, Anil Kumar. Callus induction from hypocotyls and cotyledonary leaves ex-plantson different media combinations in G. arboreum cv PA-183 & PA-402. Adv. Pharmacol.Toxicol. Vol. 11(1): 145-150, 2010. Anil Kumar, Rakesh Dadsena and Tripti Thakur. In Vitro Callus proliferation and organogenesis in Mung Bean (Vigna radiata L). Int. J. Pharmacol. Biol. Sci., Vol. 4(1) : 1-8 , 2010. Rakesh Dadsena, Tripti Thakur, Anil Kumar. Study of Antimicrobial effect of some Medicinal Plants. National Journal of Life Sciences. Vol. 06 (2): 247-250, 2009. Nikhil Mishra, Anil Kumar. Characterization of cloned Taq DNA Polymerase Gene from phage. National Journal of Life Sciences, Vol. 6(3): 257-262, 2009. Rakesh Dadsena, Tripti Thakur, S.B. Nandeshwar, Anil Kumar. Study of Callus Induction and somatic embryogenesis in cotton, Gossypium arborium PA 255 using different combination of growth regulators. The Bioscan, Vol. 4(4):721- 725, 2009. Nikhil Mishra and Anil Kumar. Cloning and characterization of Isolated Taq DNA Polymerase gene from phage. The Bioscan, Vol. 5(1): 7-11, 2010. Abha Singh, Shweta Yadav and Anil Kumar. Study of Alteration in Immunoglobin E Influenced by Chronic Exposure of Parthenium hysterophorus L. Journal of Herbal Medicine and Toxicology, Vol. 4 (1): 65-68, 2010. Anil Kumar. Antioxidant Effect of Adiantum capillus veneris Linn. On Human Lymphocyte : An in vitro study. Journal of cell and Tissue Research vol. 9(2) 1899 – 1902, 2009. Anil Kumar. Geographical Distribution of Congress Weeds: Parthenium hysterophorus L. Accepted for publication in Nature Environment and Pollution Technology. Anil Kumar. Parthenium hysterophorus L. and its impact on living world. Life Sciences Bulletin, Vol.07 (2)., 2010. Anil Kumar. Marine Biotechnology in India. Advances in Bioresearch, Vol. 1(1):1-9, 2010. Anil Kumar. Cyanobacterial diversity of some ponds of Durg- Bhilai of Chhattisgarh. National Journal of Life Sciences, Vol. 07(2):181-184, 2010. Tripti Thakur, Rakesh Dadsena and Anil Kumar. In Vitro Study of Callus Induction in Wedelia trilobata Using Different Growth Regulators. Plant Tissue Culture and Biotechnology, Vol.21(1):95-99, 2011. Nikhil Mishra and Anil Kumar. Study of Phytochemical Constituents in Three Species Of Fabaceae Family From Dantewada District of Chhattisgarh, India. Int. J. Pharmacol. Bio. Sci. Vol. 6 (3): 17-24, 2012. Rakesh Dadsena and Anil Kumar. Comparative Study of Phytochemical Constituents in Two Members of Euphorbiaceae Family From Bastar (Jagdalpur) District of Chhattisgarh, India. Int. J. Pharmacol. Bio. Sci. Vol. 6 (3):51-54, 2012. Swati Pandey, Ricah Agrawal and Anil Kumar. Biodegradation of Monocrotophos (MCP) by soil isolates of Aspergillus niger and Aspergillus fumigates under influence of Tween-80. The Ecoscan. Vol. 6(3&4): 115-118., 2012. Patel, S. and Anil kumar. Molecular Characterization Of Micropropagted Off Type Banana (Musa Paradisiaca) Using Dna Markers (ISSR & RAPD). Journal of Cell and Tissue Research. Vol. 13(2): 3739-3744, 2013. Rakesh Dadsena, Nitish Kumar Sahu, Shirish Agrwal and Anil Kumar. Phytochemical Analysis Of Three Endangered Plants (Costus Specious, Gloriossa Superba Linn And Rauvolfia Serpentine (Linn) Benth) From Kanker District Of Chhattisgarh, India. The Bioscan, Vol. 8(1), 2013. Kumudini Indira Toppo, Shubha Gupta, Deepak Karkun, Shirish Agrawal and Anil Kumar. Antimicrobial Activity of Sphagneticola Trilobata (L.) Pruski, Against Some Human Pathogenic Bacteria And Fungi. The Bioscan, Vol. 8(1):1-10, 2013. Shubha Gupta, Kumudini Indira Toppo, Deepak Karkun,Nikhil Mishra, Rakesh Dadsena, Tripti Thakur, Shirish Agrawal and Anil Kumar. Antimicrobial Activity of Achyranthes aspera Against Some Human Pathogenic Bacteria and Fungi. Int. J. Pharmacol. Bio. Sci. 7(2):43-54. Shubha Gupta, Kumudini Indira Toppo, Deepak Karkun, and Anil Kumar. Antimicrobial activity of Parthenium hysterophorus Linn. and Moringa oleifera Lam. Against some human pathogenic bacteria and fungus. Journal of Herbal Medicine and Toxicology. 7(1):89-95, 2013. Nikhil Mishra, Shrish Agrawal, S.K. Jadhav, Anil Kumar*. Traditional Applications and Phytochemical Investigation of Andrographis paniculata from Four Districts of Chhattisgarh, India. Advances in Bioresearch. Vol 5 (3):191-202, 2014. Motiram Sahu, Gautam Das Sahu, Nikhil Mishra, Rakesh Dadsena and Anil Kumar. Study of the Genetic Alteration Among Tobacco Chewers and Smokers by Micronuclei Test. International Journal of Pharmacology and Biological Sciences. Vol.9 (1&2): 157- 160, 2015. Nikhil Mishra, Anil Kumar*. Assessment of Micronuclei Frequency in Sickled Tribal Population (Halba and Gond) of District Durg, Chhattisgarh, India. Advances in Bioresearch. Vol.5 (4), 2014. Nikhil Mishra and Anil Kumar. Oxidative Stress Among Sickle Cell Diseased Kurmi (Chandrakar) Population of Durg District, Chhattisgarh, India. Journal of Environment and Biosciences. Vol. 29 (1): 61-67, 2015. Kumudini Indira Toppo, Shubha Gupta, Deepak Karkun and Anil Kumar. Study of Antimicribial Effect of Chrysanthemum morifolium Ramat. (Asteraceae) against some Human Pathogens. International Journal of Pharmacology and Biological Sciences.Vol.9 (1&2): 179-188, 2015. Nisreen Hussain and Anil Kumar*. Antioxidant activity of root of Achyranthes aspera and its comparison with Melatonin in recovery of Oxidative Stress. International journal of science and Research. Vol 4 (9): 2319-7064, 2015. Nisreen Hussain and Anil Kumar*. Comparative study of Phytochemical Constituents in Flower of Wedelia trilobata, Achyranthes aspera and Chrysanthemum from Durg district of Chhattisgarh, India. Int. J. Curr. Microbiol. App.Sci. Vol 4 (4): 150-156, 2015. Nisreen Hussain and Anil Kumar*. Phytoremediation of Oxidative Stress by Root Extract of Achyranthes aspera in Lymphocytes of Oryctolagus cuniculus L. Indian Journal of Life Science. Vol 5 (1): 024-028, 2015. Somendra Kumar, Archana Sudhakar, Neha Tiwari, Swati Pandey, Ekta Singh, Laxmi Verma and Anil Kumar. Isolation and Screening of Endophytic Fungi from a Medicinal Plant Achyranthus aspera for Antibacterial Activity. International Journal of Pharmacology and Biological Sciences.Vol.9 (1&2): 209-214, 2015. Nisreen Hussain and Anil Kumar*. Phytochemical Analysis of Flower, Leaf and Root of Achyranthes aspera from Durg district of Chhattisgarh – A comparative study. International Journal of Science and Research. Vol 5 (3): 2319-7064, 2016. Shubha Gupta, Kumudini Indira Toppo, Deepak Karkun and Anil Kumar*. Study of Antimicrobial Activity of Lantana indica Linn. against some human pathogens and its phytochemicals. European Journal of Pharmaceutical and Medical Research. Vol 3 (2): 301-308, 2016. We have a central library with more than 1 Lakh books, hundreds of Journals/Magazines/News Sources, Special cell for Researchers, beside we have separate departmental library also comprising of 248 books and 62 e-books. Our departmental library is always operational for our M.Sc and Ph.D Students. Our department is also equipped with ICT facilities – Wi-Fi System and three sites for internet access. We have separate laboratories for M.Sc students. A large number of Research journalsand Literature Banks is available in Lab to facilitate research works. Ourlaboratories are also equipped with ICT facilities. 1. In 2011, students placed in Ranbaxy Ltd. as Product Specialist. 2. In 2012, placed in Invitrogen (Life technologies), as “Field application specialist”, California, USA. 3. In 2012, placed as Assistant Professor in Government College. 4. 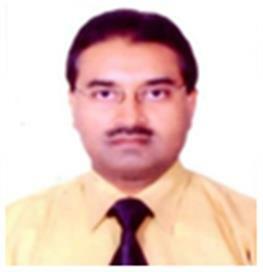 In 2013, placed as Assistant Professor in Government College and In Warehouse Corporation of India as Technical Manager. a. 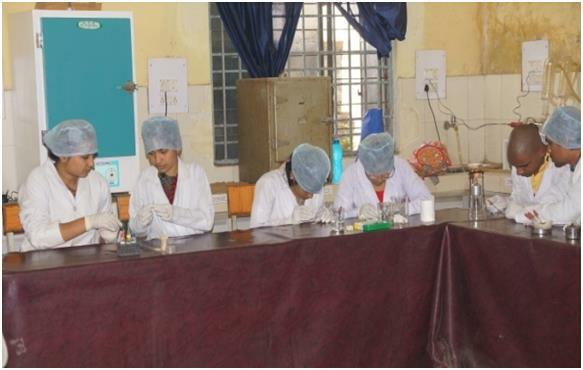 By Ethix Pharma – Selected 3 students. b. By Life Cell Ltd. - Selected 10 students. 6. In 2015, students have been selected in Indian Food Corporation of India as Technical Manager. 7. In 2015 Mr. Bhojraj Aditya selected as Field Assistant at Sickle Cell Institute, Raipur, Chhattisgarh. 8. In 2016 Mr. Motiram Sahu selected in HiMedia Solutions Pvt. Ltd.
1. The Department is running STAR College Programme of DBT, since 2012. 2. First time developed protocol for micropropagation of two medicinally important plants, Sphagneticola trilobata and Achyranthes aspera and published in PTC &B. 3. First time reported Plasmodium falciparum in homozygous sickle patient characterized at molecular level & established mutation. Finding was presented in 15th Human Genome Meeting at Dubai (13th -17th March, 2011). Finding was recognized by HUGO. 4. Estrogen Antibody based biosensor was developed by M.Sc. students during project work which was published in Journal of Immunoassay and Immunochemistry (Taylor and Francis group, UK) by three publications. 5. 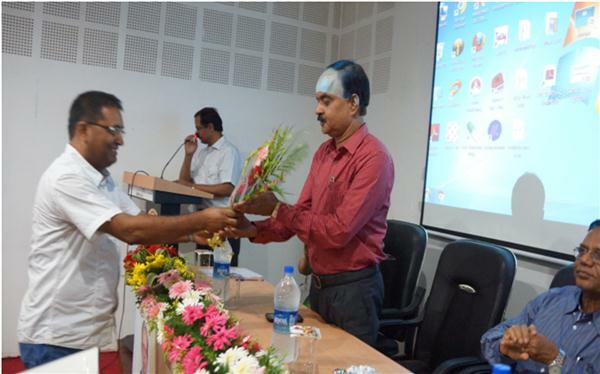 Recognized Research Centre for Ph.D. Programme of Pt. Ravishankar Shukla University, Raipur and MATS University, Raipur. 6. Detected some competent secondary metabolites from native medicinal plant of Chhattisgarh under scientific validation of traditional knowledge programme. • Maulana Azad National Fellowship 2010. • Indira Gandhi Single Girl Child Fellowship 2012. • Rajeev Gandhi National Fellowship 2013. • Rajeev Gandhi National Fellowship 2014. • Rajeev Gandhi National Fellowship 2015. • Woman Scientist Award (WOS-A) –Project Mode 2015. Best Paper Presentation Award in National Conferences by students – every year our students received best paper presentation award in National seminars sponsored by UGC and others. It is mandatory for each student to do three months external project work from other institution based on experimental research. Our students are doing their external projects from various institutions of Hyderabad, Delhi, Pune, Mumbai, Nagpur, Jabalpur Indore, Bhubaneswar, Kolkata, Varanasi etc. Besides external projects in each semester every student are being assigned for some experiment based problem and submitting and presenting their work before examiners. In each semester every students have to deliver seminar on assigned topic through PPT before teacher. Every year our students secured berth in DBT-BCIL training programme, sponsored by Department of Biotechnology, Govt. of India. viz.